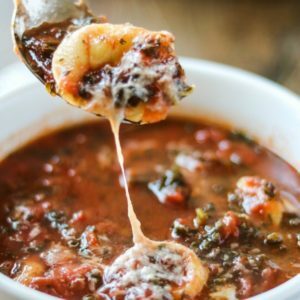 This recipe for tortellini soup only requires four staple ingredients that easily come together to create a hearty, delicious, comforting soup. Bring chicken stock, marinara sauce, frozen spinach/kale and seasonings if using. Reduce heat to medium heat and add in tortellini. Cook for 10-15 minutes or until tortellini is cooked through. If using FRESH spinach or kale, add with tortellini.